The 23rd Annual Student Leadership Awards Ceremony sponsored by Student Affairs and the Student Government Association, was held on Sunday, April 17, in Grant Gymnasium. Student groups and individual students were recognized for their leadership involvement at the Webster Groves campus, with approximately 170 students and guests were in attendance. Many of the awards were presented by alumni, former award recipients who returned to honor current student leaders. Provost Julian Schuster presented the Capstone Award and President Elizabeth (Beth) J. Stroble presented the George Herbert Walker III Award for Leadership. 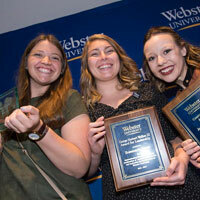 Gaby Deimeke, a graduating photography major, and Rosie Jones, a graduating women and gender studies and philosophy double major, were presented with The George Herbert Walker III Award for Leadership. The Walker Award is awarded to the graduating senior who has demonstrated the most significant combination of academic achievement and leadership during his or her student years at Webster University. Deimeke and Jones will share the $2,200 scholarship that accompanies the award. Many of the awards were presented to students by alumni and former award recipients. President Stroble (center) presented the George Herbert Walker III Award for Leadership to Gaby Deimeke and Rosie Jones. Additionally, 14 graduating students received the WebsterLEADS Leadership Certificate and medallion, which they will wear at commencement. View more photos of the awards ceremony at the University's Facebook page.